Discussion in 'Grand Theft Auto V Modded Lobbies' started by BrownMagician, Nov 1, 2015 with 4,195 replies and 787,595 views. Everything working on latest update! Below shows what accounts are available for XB1 and PS4 at the current time. Always check back as new ones MAY BE added, or the one you may have wanted might have been sold. Click the spoiler to view what that specific account will come with. PC Services are also listed below. Extras: Few high-end apartments already purchased along with some high end super cars, CEO, and Motorcycle Club. $400 - XBOX ACCOUNT WITH BILLIONS!!! PC SERVICES ARE NOW BACK UP AND AVAILABLE! *REMEMBER* THIS IS BUY AT YOUR OWN RISK AND WE ARE NOT RESPONSIBLE FOR ANY BANS/RESETS THAT MAY OCCUR. WE ALWAYS USE EVERY METHOD POSSIBLE TO KEEP YOU AS SAFE AS POSSIBLE! 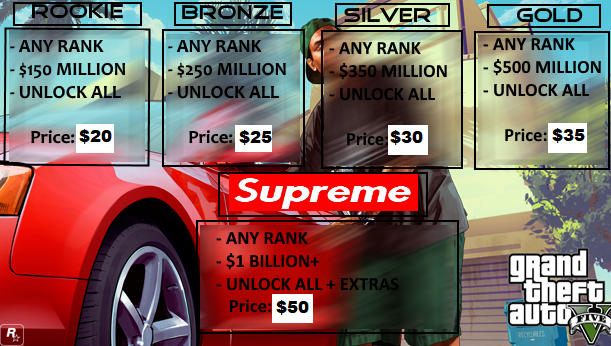 After you pay, I will need your Steam or R* Social Club Account Information, so the money, rank, and/or unlocks can be added to your account. The FAQ section in the spoiler below offers a wealth of information about the services being offered, please give it a read if you are interested in purchasing. - I accept payments made through PayPal, Credit Card, and Visa Debit. How does it work? What happens after I pay for a next-gen premodded account? 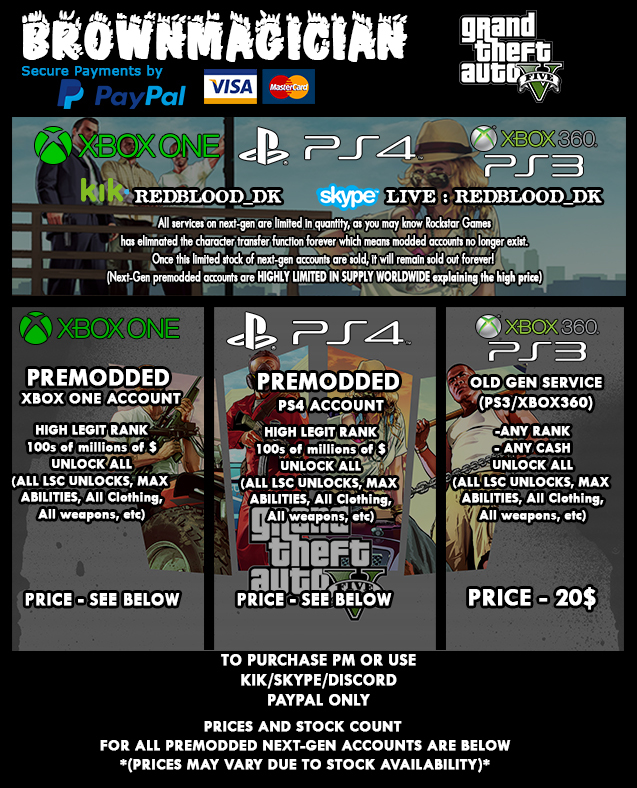 - After you pay and I confirm purchase, I will give you an email and password which you will use to download to your PS4 or XB1 and sign-in to GTA5 with. You will use the account I provide you to play GTA Online and it will now be your new account. I sent you a message on se7ensins/kik/skype how long does it take for a reply? - I reply to everyone in a timely-fashion, but if for some reason you don't get a reply, remain patient, I reply to every message so hang in there. Will I get banned/reset? are there any restrictions on what I can/can't do? - I have been modding for years, I know the ins and outs of everything GTA5, and personally have experienced every single ban-wave. The accounts have survived numerous ban waves and all have stats which look natural, so you are free to do anything you want and spend as you please without worrying about any bans/or resets. I have a problem with my service what do I do? - If you ever have a issue with the service you have paid for and received, contact me, be patient I will reply and work with you to get your issue resolved. I value each and every one of my customers, and will do my best to resolve any issue that may occur. This service is run as a separate entity of Se7enSins.com and BrownMagician. Se7enSins and BrownMagician accept no responsibility under any circumstance. 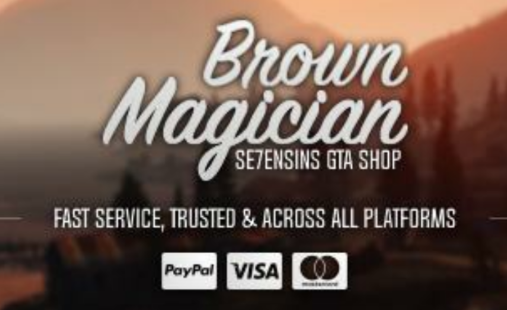 By purchasing this service, you relieve Se7enSins and BrownMagician of all legal responsibility. Sorry, But this is a payed service. And this is not a lobby, its done on your Xbox account. 100% trusted and 100% worth it! Definitely hit this guy up if you want money. He's legit and has some of the best customer service around! Is this a lobby for cash or do I need to give my account details? if you want cash on the xbox360 you can just pay me via paypal and I will invite you to your cash drop lobby. Start a private conversation with me if you wish to do so. CASH DROPS ARE NOT FREE PLEASE DO NOT POST YOUR GAMERTAG IN THE THREAD. IF YOU WOULD LIKE A CASH DROP PURCHASE ONE FROM ME USING PAYPAL! TO PURCHASE RIGHT NOW WITH PAYPAL START A CONVERSATION WITH ME BY CLICKING THE LINK BELOW! Works on XBOX360, and transfers over to XBOXONE, and PS4! Stupid question: For recoveries, can you do it on Xbox One? I've had my account recovered on the 360 before and transferred. I guess my only solution is to make a new account and get you to recover it, huh? this is correct. that is the solution. You must give me an account that has never been transferred over to the Xbox One. Congrats on getting a recovery thread spot. Vouch. Very honest, quick seller. Gets right to the point and gives just what you ask for. Would purchase again.